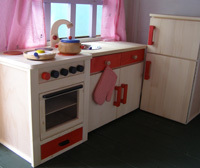 A charming and generously sized playhouse with classic double fronted georgian windows and an overhang porch feature. 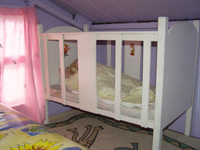 The Honeysuckle playhouse will provide hours of fun and amusement for your children. Built to exceptional safety standards to meet European Toy Standard EN71, Honeypot playhouses are constructed with an attention to detail and their natural look will enhance your garden, while giving pleasure to your children or grandchildren. The building is shiplap T&G clad and the roof and floor are constructed using OSB (resin bonded board). Glazing is safety Styrene and the door is 2' x 3'7" (0.6x1.08m) in size. Please note, the depth includes the 18" (0.46m) verandah. Self-assembly by customer (instructions supplied). Made from high quality 12mm thick pine wood. The Honeysuckle can double as a toy store during winter months too! 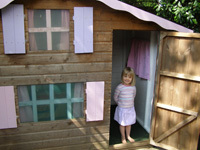 Exact measurements to ensure this playhouse will fit your garden for your children's outdoor fun ! Supplied with fixtures, fittings and roofing felt. FREE factory applied base coat timber treatment.